AS GRAIN FARMERS OF ONTARIO heads into our third year, I am pleased with the progress we have made as an organization and excited about some great new initiatives for the future. Over the last couple of years, we have heard a consistent message from our members that our research priorities are the right ones to meet the needs of farmers. Our research budget and profile has increased over the last two years as we partner with industry and organizations within Canada. In the next year, our research alliance with eastern Canada will again apply for Cluster funding – a large federal funding envelope that, if we are successful, can greatly increase our effectiveness in public cereal and soybean breeding. In market development, our organization is focused on connections throughout the supply chain to increase the use of Ontario grain domestically and find ways to increase the value of our products through stronger connections with buyers and consumers. We are making headway with winter wheat buyers concerned with protein content and will continue to communicate the varieties to growers that fit the requirements of our end users. Our organization will also continue to enable the use of our crops in products like Super Squeezies soy desserts that are on store shelves and promise a tasty snack for kids that will support brain development with the DHA from soybeans. 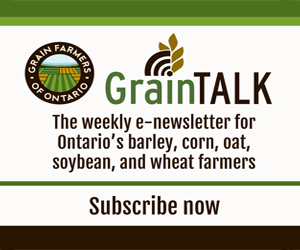 Looking ahead, some interesting opportunities will come out of a report completed for Grain Farmers of Ontario on the wheat industry that will unite the supply chain even further through a technical support network developed in Ontario. More information is available in the Market Development Guide included with this edition of the magazine. In regards to wheat marketing, Grain Farmers of Ontario continues to offer a marketing alternative for our farmer/members. We added to our marketing program a couple of new programs to keep it relevant for the market conditions. When it comes to advocacy, our organization has grown in strength over the last two years through consistent messaging, a solid plan, relationships with government and a measured response to issues as they arise. These efforts are ongoing both at Queen’s Park and in Ottawa. Going forward, we will continue to identify opportunities to increase our research portfolio and grow domestic and international markets through a partnership with government and to address issues like risk management and environmental and industry regulation to ensure our members’ needs are met. Our communications efforts have placed us in a leadership position in the province with the media and the general public through the outreach efforts of both Grain Farmers of Ontario and Farmers Feed Cities, while the magazine is a leading publication in the agricultural industry. In the future, our organization will increase our efforts in the digital space with more tools to enhance decision making at the farm level. We will also seek out more opportunities to extend our reach beyond traditional channels to address the information needs of Ontarians trying to make sense of the changes in the food industry and the other opportunities for renewable energy and consumer goods.